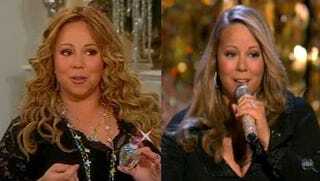 Something was just a little off on Mimi's hour-long ABC Christmas concert last night. She looked slightly smooshed, especially when compared to her recent HSN stint. It's reminiscent of the time she painted her abs on. She even toyed with the aspect ratio backstage during her Make a Wish Foundation meet and greet. And just because it's the best holiday song ever, here's her performance of "All I Want for Christmas Is You."